I say ‘acquired’ because a some of them were gifted to me by lovely ladies at the Sewing Directory meet up in Exeter. The lovely Helen from Indianna Dreams gave me the gorgeous yellow floral print at the top right, some of the others came from a generous blog reader and local lady Sue – thanks very much ladies. I have found a few pieces in the charity shop recently and they are making their way into vintage sheet charm packs in my etsy shop (in which I had my best ever month for sales in March – woo hoo!). I had a pack from you and sorted them into colours yesterday, ready to start sewing with next week, I will be posting about it. I am not sure what they want to be yet but it will come. 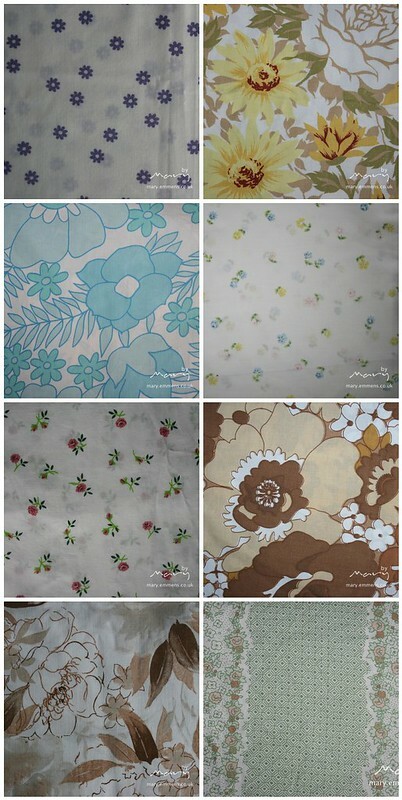 My Nan used to have a pillowcase in the blue floral pattern! Brings back lovely memories. Wow! I love them, especially the large blue flowers, second row on the left. The one on the top right is lovely! Collecting is so much fun!